I really love how smooth driving is with this car, it makes running errands and getting to school and work on time easy! It is always an easy start up and with the simple yet sleek interior, it is easy finding all the functions you need. I can start my car up early in the morning on a freezing day, and it will be warm and defrosted within 10 minutes or less! Even though this car may appear small, which is perfect for a short lady such as myself, I can still fit 3-4 friends comfortable in the seats! This is great for outgoings and family/friends. I believe this car will last me years to come. It runs well and has a roomy trunk. It is a good family sedan. I like that it's paid for. Even though it's older, it still runs well and has under 77,000 miles. It's also excellent on gas mileage. It has a tape player and a CD player. The only thing I dislike about it is the previous owners left it out in the desert sun and some of the paint has flaked off the handles. But that's just cosmetic and besides that, I have no complaints. I love this car. 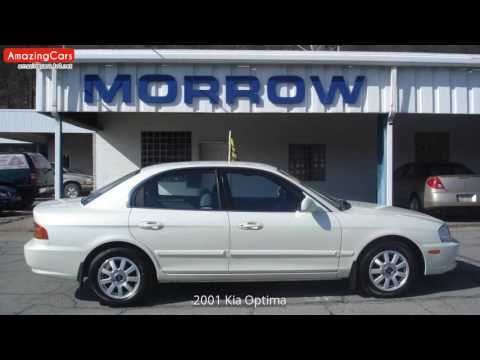 Great used white Kia. Sunroof and mileage are a plus. Love the sunroof and mileage. Did have to do entire timing system and just did exhaust to catalytic. Only thing I hate is 1 ring bad and burning oil slowly. It only smokes because of this while idling for too long or when I hit any highway. But only smokes on highway for say a 1/4 mile. On certain passenger vehicles, the side air bag wire harness for the driver position for the driver position could be misrouted. This could result in its being pinched or cut by the seat cushion tilt mechanism. Damage to the wire harness could result in the side air bag not deploying in an accident. Dealers will check for proper routing of the side air bag wire harness and secure it in place with a plastic tie-wrap. If the wire harness is damaged, it will be replaced. The manufacturer has reported that owner notification began May 11, 2001. Owners who do not receive the free remedy within a reasonable time should contact Kia at 1-800-333-4542.